A beautiful silver mounted French violin bow by Louis Morizot freres - c. 1940 made - with certificate of authenticity. This is a very beautiful example of the Morizot (père et frères) work. 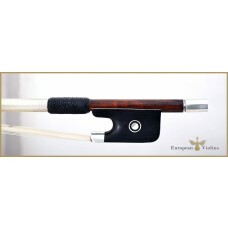 A perfect soloist bow for the violonist who wants a more heavy, but still very elegant bow. Louis Joseph Morizot and his sons (frères) are one of the most important French bow makers inthe 20th century of french bow making. The strong and heavy stick is made from the finest brown pernambuco wood and is round shaped. A strong good bow, with a fine balance and a very strong tone production. 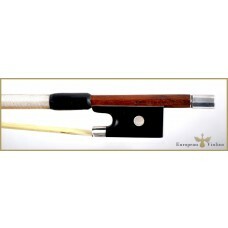 The total length of the stick is around 72,3 cm and the weight of the bow is around 63 gr. The bow is straight and has a beautiful cuve.